Wale works a Bonnie-and-Clyde narrative into his progressive black love storyline in “Black Bonnie.” The Yasha Gruben-directed clip starts with a simple statement — “Beside every good man, is a great woman” — before casting Ashley Blaine Featherson (Joelle Brooks from Netflix’s Dear White People) as the title lady. The video starts in Africa, where Wale and Featherson are waited on like king and queen. The couple trade in their indigenous, embellished garb for leather coats and berets as they fast-forward to the 1970s in America as members of the Black Panther Party. 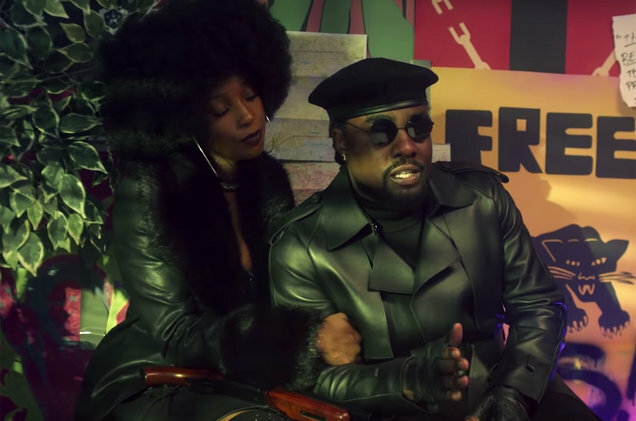 Where the first setting made them feel straight out of the Black Panther film, Wale and Featherson are depicted as icons of the political movement in the ’70s. Spray-painted black fists in the air and secret meetings to plot their revolution set the backdrop for this moment in their journey as lovers. Wale puts his trust in her as the FBI breaks down the door of their hideout, singing, “She tell me I got you, I trust her intuition,” as she leads him out the back. Jacquees, although not present in the music video, croons over the chorus, emphasizing that being on the run doesn’t mean they can’t “still chase our dreams.” It’s a romance depicted throughout black history, telling the story of being in love while living in a life-threatening time. Nonviolent protests turn into kids playing with water guns, as Wale travels to the ’90s and still kicks it with the same girl. As he calls her from outside her apartment to pick her up, the police pull up behind the rapper’s red Mustang convertible. From a single fist up to both hands raised in the air, Wale’s defense is the same — as it has been for African-Americans throughout the history he depicts in just four minutes. HBCU Love: Wale & Chloe Are Now Parents — We’re Here For This!